COLUMBUS, Ohio–A low-density sheet molding compound (SMC) recently introduced by Core Molding Technologies, Inc. (CMT), is reported to be an ultra-low density SMC with a density below that of water and most thermoplastic systems. Core's HydriliteTM SMC combines a nominal density of 0.98 sp.gr. with mid-range mechanical performance and a high-quality surface appearance, the company reported in a press release. Its density is lower than Core's Airilite® and Econolite® SMC systems, which test at 1.18 sp.gr., and is said to be 50 percent lower than standard-density SMC materials. Core Molding Technologies (coremt.com) is a North American compounder of custom sheet molding compound and a molder of fiberglass reinforced thermoset and thermoplastic compounds. The company specializes in large-format moldings and offers fiberglass processes that include compression molding of SMC, glass mat thermoplastics (GMT) and bulk molding compounds (BMC); compression and transfer molding of direct long-fiber thermoplastics (D-LFT); and vacuum resin transfer molding (V-RTM). 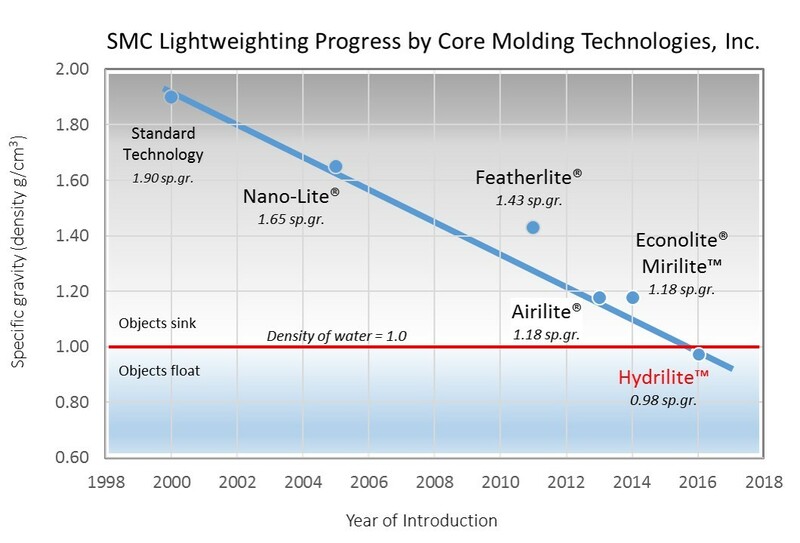 "Across our markets, customers continue to challenge us to lower the density of fiberglass reinforced material systems to support their light-weighting efforts," said Terry O'Donovan, vice president, marketing and sales for Core Molding Technologies, in the release. "A molded product that weighs 100 pounds in standard-technology SMC would weigh only 51 pounds in HydriliteTM SMC." Hydrilite SMC is formulated with a high-performance resin system and is reinforced with 41 percent glass fiber by weight. "The use of glass fiber results in a material system considerably more economical than those based on carbon fiber, while achieving even lower density," O'Donovan said in the release. Hydrilite SMC is reported to achieve nominal tensile strength of more than 75 MPa and impact strength of 850 J/m. Both results are on par with Core's standard-density reinforcement-grade SMC formulations, the company reported. This performance, along with other mechanical properties of the system, is said to make it suitable for a broad range of lightweighting applications that require a combination of strength and high appearance. A commercial program using Hydrilite SMC is undergoing customer qualification, and other applications are in development, the company said. Core Molding Technologies maintains plants in Columbus and Batavia, Ohio; Gaffney, South Carolina; Winona, Minnesota; and Matamoros, Mexico.